Penn & Teller's giant faces try to intimidate me upon arrival at The Rio. 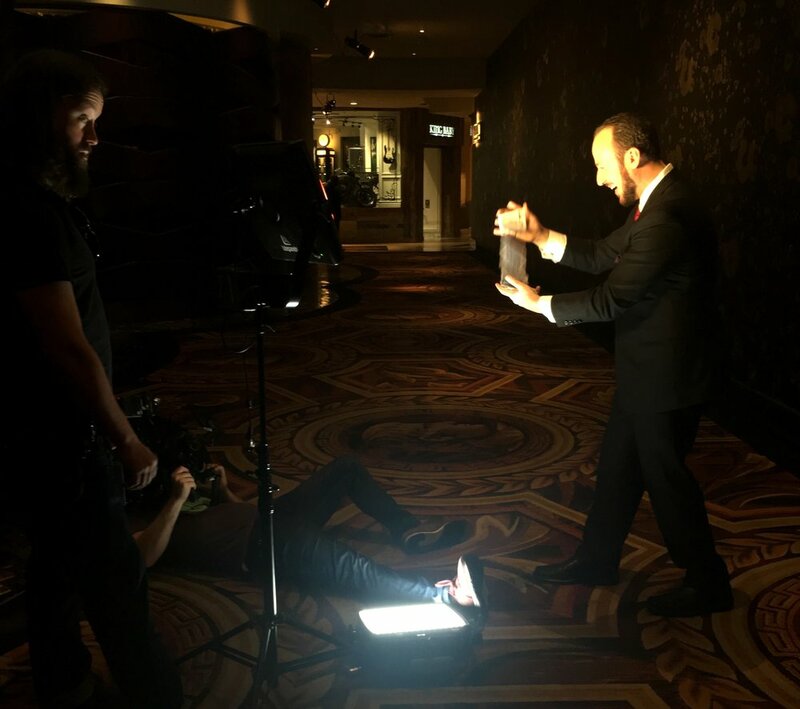 Tonight is another new episode of Season 5 of “Penn & Teller: Fool Us.” While viewers will see 5-8 minutes of a particular magician’s performance, let me tell you about the 3 days each of us spends in Las Vegas getting ready for the showtime/showdown with Penn & Teller. My wife, Amy, and I arrived in Las Vegas the previous night so we can trick our brains into thinking that West Coast time was the new normal. My wife, Amy, was there to clap in the shot, straighten my tie, and make sure I said everything I'd planned to. "Extras" react to my magic, as Jay Sharron films and Guy Toam (foreground) directs. The total shoot takes about 4-6 hours and is different for each performer. Each of us worked with our own producer on our spot. After a few phone conversations weeks ahead of time, we planned out a narrative and decided on which magic would look great. The producer’s job is to not only plan a unique story for each performer, but find ways of making each story look different. Working with Caesar’s Entertainment, they plan out visits to different properties. The sites selected for us were the Rio's conference area, as well as the flagship property, Caesar’s Palace. While in 2015, we filmed poolside, this time we did just a short amount of filming in the hallway near one of the restaurants. That's camera wizard, Jay Sharron, there on the ground getting that slow-mo shot. The crew was very excited about making this shot happen, as they had brought a special, slow-motion camera to capture the springing of the cards. The shot turned out so great, the producers of the show ended up using it as the opening shot of this season’s first commercial for the show. We were very lucky to work with an incredibly talented crew, including producer and editor, Guy Toam, and cameraman, Jay Sharron. This day is much more casual, but I decided to treat it as a dress rehearsal. 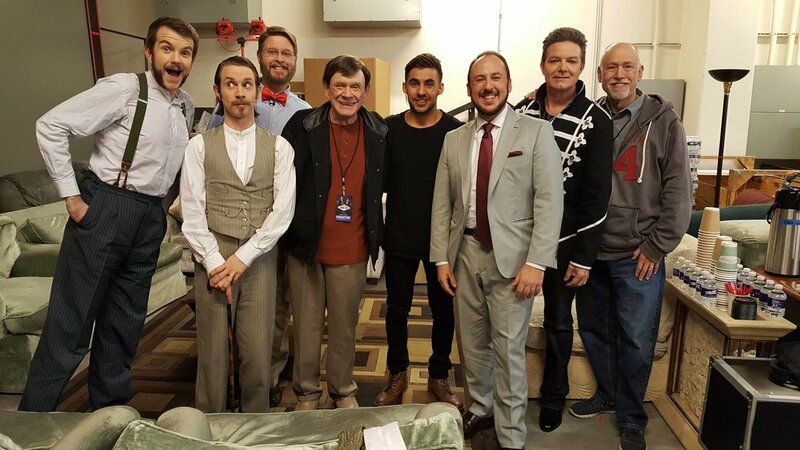 I met with Michael Close and Johnny Thompson, the two magic consultants that work for the show. Johnny and Mike are not only great people, they are brilliant magicians. Their job is to know exactly how the magic effect works, so that they can make the call whether Penn & Teller’s guess is correct or not. While Johnny and Mike help the magicians finesse the technical aspects of the effect, the producers of the show, Andrew Golder and Lincoln Hiatt, provide feedback on blocking and performance. Taking direction from Andrew Golder (right) and Johnny Thompson (left). In the photo above, you can see Amy hanging out in the background, and behind us are all the different sized tables and chairs the performer can use. This year, the height of the table was a major factor for me, and I couldn’t decide whether to sit or stand until the last moment. What I did want for sure was Penn, Teller and Alyson as close to me as possible, and seated so that the cameras could catch their faces and reactions. I performed my trick in rehearsal, and we had the rest of the day to relax. I’ll tell you more about where we went and who we ran into in a future post. Day 3 - Showtime Showdown! Since this was the first episode that was being filmed this season, it was the only one they were scheduled to film that day, along with a few spots for their “April Fool’s” special which aired earlier this year. We arrived in the early afternoon, got dressed and went through one full dress rehearsal on stage. It’s important to note that Penn & Teller are nowhere near the theatre at this point, as they are not allowed to see who is performing until we walk out onto the stage to record. Getting mentally prepared during dress rehearsal. That's Alyson's stand-in on the left. During rehearsals, there were stand-ins for Penn, Teller and Alyson. I went through the blocking with the producers, confirmed my selection and placement of chairs and tables, and then went downstairs into the basement of the theater with the other performers. One by one we were led to do hair and make-up, followed by several hours of waiting for our turn. Right before the filming started, Michael Close and Johnny Thompson came downstairs to wish us all good luck. We took a group photo and then each one of us went through our own pre-show strategies, as we waited to be called to the stage. It was an action-packed 3 days, filled with much anticipation. The trick that I had selected is not something easy and not something that works 100%. So along with thinking of the blocking and scripting, I was still spending every hour I had free practicing the trick. I’ll tell you more about that next time. And stay tuned to Fool Us, as episodes are airing every Monday. The episode I am a part of is called “Here Comes the Magic” and is set to air July 16, 2018 on the CW.